Hey there, welcome back to the Art of Business English. I hope everyone had a great Easter break. I hope you’re all feeling recharged and ready to get back into work and the daily routine. Today we are going to finish the third part of our 3-part series into dependent prepositions. In the last episode we are going to look at nouns with dependent prepositions collocations. As with the previous episodes I have divided this one into three parts. First, we will look at what noun proposition collocations are. Then, I will give you a list of common noun + prepositions and finally, in the last part I will provide you with some examples in context. If you struggle with collocations and prepositions, then this episode is definitely for you. Understanding and using the correct preposition after nouns is essential to sounding more fluent. If you haven’t already listened to the previous two episodes in this series, then I encourage you to do so. What are nouns + preposition collocations? Just like with verbs + preposition, some nouns in English are followed by a preposition to form collocations. 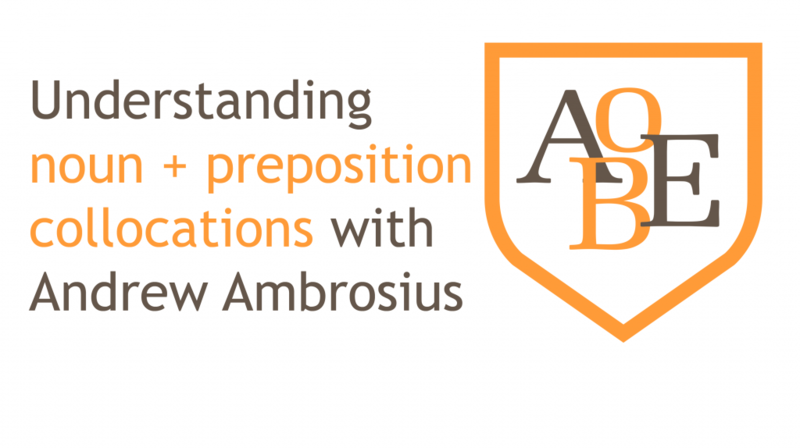 The reason why a proposition must follow these nouns is to show us what they relate to. It is impossible for these nouns to appear without a proposition. the good news is that as they are collocations, the form is usually quite strongly fixed. By this I mean, that usually there is only one specific preposition that occurs after the noun. Remember, we have several episodes on collocations, and I encourage you to listen to them. Let’s take a look at an example. If we take the noun awareness, then we must apply the preposition of, in Spanish, awareness means conciencia o conocimiento. As with English, in Spanish we would say conocimiento de, so in this case the noun + collocation is quite simple and similar to apply. Just as with Spanish, we need the preposition to show that there is awareness of something. In this example awareness of uses a similarly translated preposition to Spanish. The problem arises when the non-native speaker applies the wrong preposition. This can occur with the preposition for which in Spanish can be por or para. Some of my students use by instead of for. In the end, the only way to apply the correct preposition is by learning and memorising the correct one after each noun. As I have mentioned in previous episodes, when we are dealing with collocations with a fixed form then all we have to do is memorise them and then we know them for life. They don’t change! Now that we understand what noun and preposition collocations are, let’s take a look at some common ones. In this part I have divided the noun + preposition into sections according to the specific preposition that follows the noun. Obviously, there are many more nouns followed by preposition collocations, however this list is a great start and many of these expressions can be used in a wide range of business areas. Now, in the next part of the episode I will be giving you some example sentences within context. As with the previous two episodes, I have categories the example according to the business area. On behalf of the whole team, I would like to thank you for joining us here today. Here is the latest report from last week’s meeting. You will see there is a delay in receiving several orders. With reference to the last point in your previous email, I can confirm that I will be free to meet your next week at the suggested time. As we can see here in this chart, there has been a rise in Capital Expenditure. When we enter the next room, I would like you to take notice of the machine to your left. Yes, hello Jim, it’s Brian here. I am calling to let you know that in theory we have agreement from all parties and we should be able to close the deal this week. We would like to make it clear that there is no connection with the recent drop in the company’s share price and the on-going police investigation. Well, that brings us to the end of the episode. Well, that brings us to the end of the episode. If you haven’t already listened to the 2 previous episodes for this 3 -part series, then I encourage you to do so. Remember, all of these noun + proposition collocations can be found over at The AOBE website. Again, I encourage you to take a look and start to make a note of your favourite expressions. You can start by learning one expression from each proposition group. These can be included in your next meeting, presentation, telephone call or report. As I have said many times before, in order to internalise these noun preposition collocations, you must start to use them. It is much easier to learn 5 at a time than memorise a whole list. Come back to this post when you have internalised a few and then grab some more. Well, that is all we have time for today. Make sure you share this episode with your friends and family. If you love the AOBE then please write us a review over at iTunes. Once again, if you have any questions or comments then don’t hesitate to contact us at the AOBE website or on our Facebook page. We are more than happy to help you and produce an episode on a topic that you are interested in. Till next time, have a great week and I look forward to having you here again soon .